North Korea conducted a ground-test last week of its new KN-11 submarine-launched ballistic missile amid heightened tensions on the Korean peninsula, defense officials said. The missile test March 16 involved a "pop-up" or "ejection test" of the developmental SLBM from a canister ashore at the Sinpo shipyard, located on North Korea’s east coast where the KN-11 is being developed along with the Gorae-class missile-firing submarine. It was the second recent test of this sort, following a Dec. 21 ejection test, and was the first SLBM test since the United Nations imposed tougher sanctions on Pyongyang. At the Pentagon, spokesman Cmdr. Bill Urban said: "We’re not going to comment on matters of intelligence." The test appears to violate a recent UN Security Council resolution, No. 2277, which on March 5 tightened economic sanctions on North Korea in an effort to block development of nuclear arms and nuclear missiles. The new resolution states that a 2015 SLBM missile ejection test violated earlier UN resolutions aimed at curbing both nuclear and missile programs sponsored by the Pyongyang regime. "All such ballistic missile activities contribute to [North Korea’s] development of nuclear weapons delivery systems and increase tension in the region and beyond," the resolution says. The earlier ejection test was first reported by the Washington Free Beacon on Jan. 5. The new UN resolution followed North Korea’s underground nuclear test on Jan. 6 and missile test on Feb. 7. North Korea attempted an underwater flight test of the new KN-11 on Nov. 28 that severely damaged the launching submarine. Officials said the Gorae sailed back into Sinpo from a position in the Sea of Japan listing at a 40-degree angle as a result of internal damage from the failed SLBM launch. Disclosure of the SLBM test comes as North Korea on Monday fired five short-range ballistic missiles and has threatened to conduct further nuclear and long-range missile tests in defiance of international pressure. Urban, the Pentagon spokesman, said five short-range ballistic missiles were fired in the latest missile test firing by North Korea. "We closely monitor North Korean military activities and the situation on the Korean Peninsula," Urban said. "Launches using ballistic missile technology are a clear violation of multiple UN Security Council resolutions. We call on North Korea to refrain from actions that further raise tensions in the region and focus instead on taking concrete steps toward fulfilling its international commitments and obligations," he said. 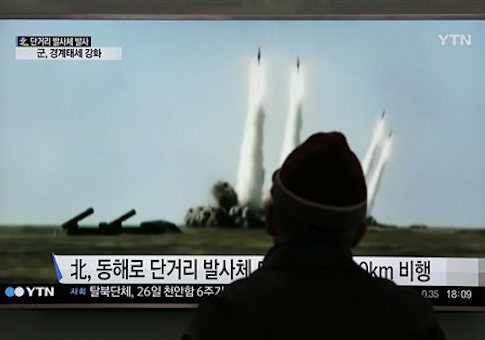 South Korean media said the five missiles were launched near the city of Hamhung and flew about 124 miles into the sea. North Korea has been steadily escalating military provocations in response to the new UN sanctions and in response to large-scale U.S. and South Korean military exercises now underway in South Korea. South Korean President Park Geun-hye also warned Monday that Pyongyang could carry out additional military provocations and urged the country to remain vigilant. "Now is a very crucial time for the future of the Korean Peninsula," she said during a meeting with aides at the presidential office in Seoul. North Korea’s dictator Kim Jong Un vowed in recent days that his country would soon conduct a nuclear warhead test blast and fire several kinds of ballistic missiles capable of carrying nuclear warheads. Two days after last week’s SLBM ejection test, North Korea fired two medium-range Nodong ballistic missiles. The road mobile Nodongs were fired from the country’s east coast, and one traveled about 500 miles before falling into the sea. The second missile blew up in flight. U.S. military and civilian intelligence agencies have stepped up monitoring of North Korea in anticipation of further provocations. Among the possible coming provocations, according to defense officials, are North’s Korea’s first flight tests of either the KN-08 road-mobile intercontinental ballistic missile, or the new intermediate-range Musudan missile. Both missiles have been fully developed but have not been flight tested. There are also indications the North may conduct another underground nuclear test. "There are a lot of signs that something is going to happen," one official said. Japan’s Fuji television reported Friday that a U.S. Air Force Cobra Ball reconnaissance aircraft was deployed to Kadena Air Base on Okinawa as part of stepped up monitoring of North Korean missile launches. The Pentagon’s most recent annual report on the North Korean military said the rogue nation’s development of SLBMs aims at creating multiple delivery systems for nuclear weapons. "North Korea’s pursuit of a submarine-launched ballistic missile capability also highlights the regime’s commitment to diversifying its missile force, strengthening the missile force’s survivability, and finding new ways to coerce its neighbors," the report said. In addition to the SLBM, North Korea’s long-range nuclear-capable missiles include the Taepodong-2 and the KN-08. "The KN-08, an IRBM, and an SLBM have not been flight-tested and their current reliability as weapon systems would be low," the Pentagon said. The report said North Korea attempted a flight test of its SLBM in November "but it ended in failure." "North Korea is committed to developing a long-range, nuclear-armed missile that is capable of posing a direct threat to the United States," the report said. Defense officials said the development of the KN-11 SLBM remains a high-priority missile development program and the weapon could be fielded in the next two years. A Washington research institute, 38 North, published satellite photographs last week revealing continued work at Sinpo on both the KN-11 and the Gorae. The photos indicate that a removable tower was moved to a test stand capable of supporting a rocket engine, missile or launch tube and then later removed. A report said the test stand is a sign that North Korea could "quickly conduct a pop-up test" of a missile. The report said unspecified work on the Gorae submarine over the past two months was completed. North Korean supreme leader Kim Jong Un was photographed by state-run media on Sunday observing large-scale North Korean military exercises. Last week, North Korean media showed Kim with a metal sphere—purportedly a missile-sized nuclear warhead. He was also photographed at a test of a metal shield that would reportedly be used to protect nuclear warheads from the heat of reentry into the atmosphere after launch through space on a ballistic missile.